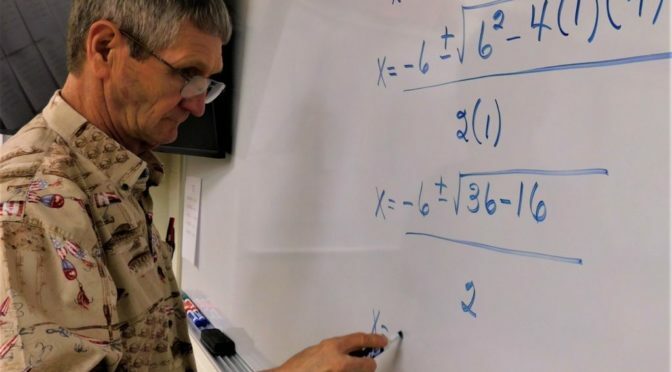 Alan Shinn has been a math teacher for 50 years at Uniontown High School, getting to his math room by 6 or 7 a.m. daily to prepare for class and be available for students with math questions. As of May 17, he is retiring. His long tenure began with an interest in math as a youth. 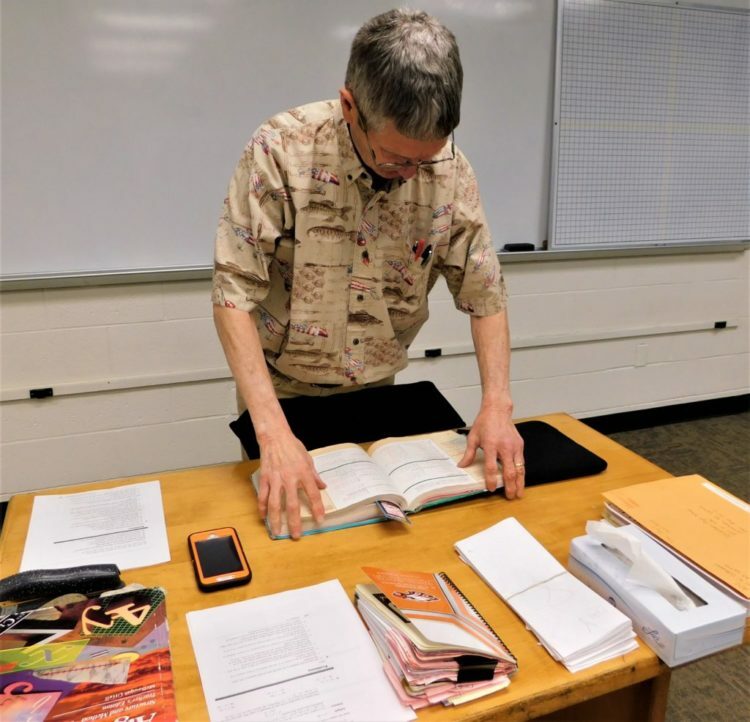 As a freshman at Iola High School, Shinn was challenged by his algebra teacher, Mr. Jewell. 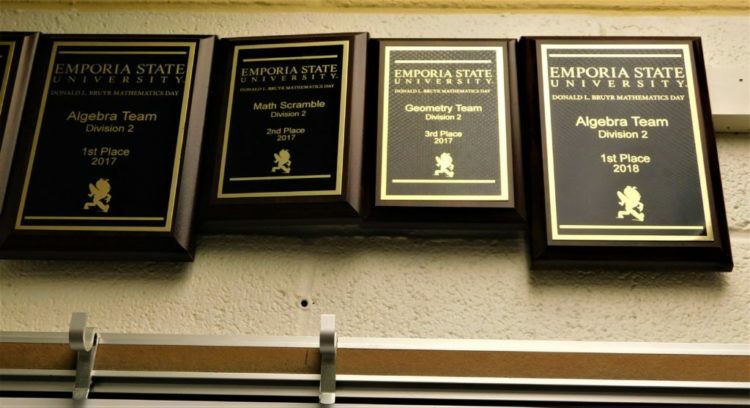 Shinn attended Allen County Community College, then Kansas State Teachers College at Emporia, getting a degree in mathematics. He was the first person in his family to attend college. 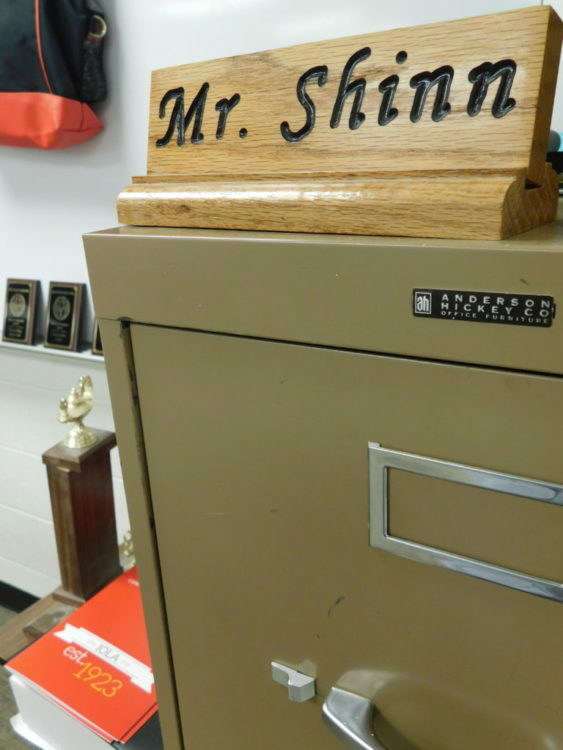 Shinn started his first year of teaching math at Uniontown High School in 1969, with a $19,000 contract. He found out about the UHS math vacancy from his uncle Don Nichols, who was the math teacher at the school for seven years. His first year of teaching was a learning curve. “The first year, my wife and I would go to Kansas City (to visit Don Nichols) a half-dozen times to get advice and answer questions I had about teaching,” Shinn said. “I owe a lot to those two gentlemen: my freshman teacher and my uncle,” he said. During his first year of teaching at UHS, Shinn was offered a scholarship from the National Science Foundation (NSF) through Pittsburg State University to get his masters degree in math. At that time in history, science and mathematics were being strongly encouraged in the U. S. education system due to the space technology challenge from the Russians. “They (NFS) paid for the master’s degree,” Shinn said. In his 50 years of teaching at UHS Shinn has coached math students into more than one hundred first-place victories in competitions with from three to 30 schools. Additionally, he has coached students to 46 second-place school awards and 24 third-place overall school achievements. Some of Shinn’s math students’ awards line the wall in his room at UHS. Additionally, a current UHS senior and sophomore have a desire to become math teachers, he said. “I hope that I have made a difference,” he said. 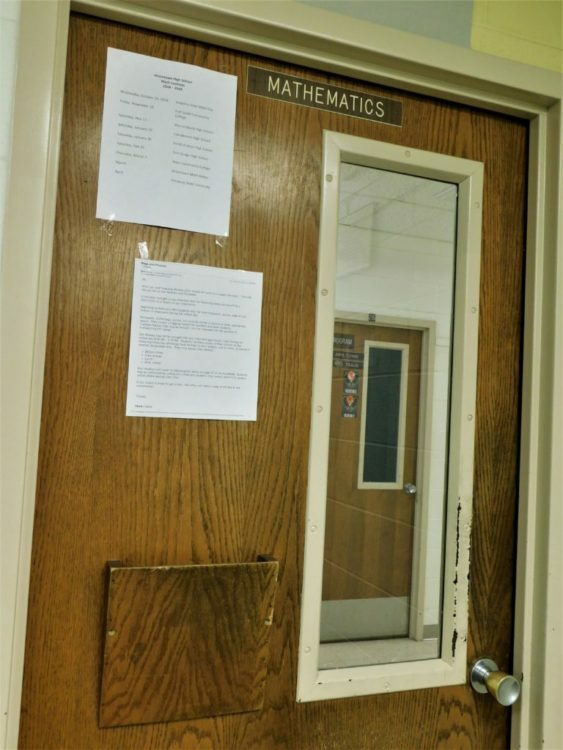 The door to Mr. Shinn’s UHS math room. Mr. Shinn made an indelible impact on me. He is a great educator. He certainly challenged me to be a better student. Wouldn’t you know it, he was right. I use math frequently in my profession. Congratulations and thanks for your effort on all the unruly students like me. Me. Shinn was an awesome ‍ teacher. I even called him while I was in Radiation Therapy School at Washburn University in Yopeka for help with word questions. Time flies, but your good efforts will live on in other teachers. I am sure your retirement years will be as productive as your teaching years. Thank you for doing your best for your students. Alan, I am thankful I got to visit with you and see your classroom while I was in Kansas for spring break. You have inspired several generations of students and instilled in them a love for mathematics. Enjoy your well deserved retirement. Thank you Allan for your kind words about my father. Congratulations on your 50 years of teaching and your retirement. I am one of the math teachers you inspired to follow your lead. I love math because of you. Thank you for assigning me all that homework! I have known and respected Alan for his entire career. I got my chemistry Masters degree from PSU in the same NSF scholarship program as Alan got his math. Our paths crossed often and I have always understood why his colleagues AND students held him in such high regard. Uniontown has been good for Alan and Alan has been even better for Uniontown students. I loved my math classes with Mr. Shinn. They were my favorite. I still love math today and am able to help my kids with homework because of him. He always made math contests so much fun. Thank you for all you taught me. I couldn’t have asked for a better teacher. Math class wasn’t always my favorite, but I learned a lot. Thanks Mr. Shinn for a being a great teacher. Thank you Mr. Shinn for inspiring me to love math so much. Even when you were my bus driver also and I was the last student on your route you took the time to stop the bus and explain and help me with your assignments. I still remember the trailers East of the main building where one was your classroom. I wonder how many thousand’s of students you dearly touched during your long career. Happy retirement. Mr. Shinn teaches more than just mathematics. He shares the principles of Humility, Passion, Unity, Service, Thankfulness and Accountability with his students. I was never strong in math, but I appreciate these lessons. I apply them every day. Thank you for your dedicated service Mr. Shinn. God bless you and enjoy a well-deserved retirement. I could not imagine my life without having learned math from Mr. Shinn my best memories of high school came out of that classroom. Thank you for everything you taught us. Thanks for all you did for our kids, Alan. Enjoy your retirement, you good and faithful servant. You will be hard to replace.